Inverell Speedway Trust Secretary Ashleigh Taylor, left, Northern Tablelands MP Adam Marshall, and Trustees Brad Hannah and James Smith discuss the new funding for the Inverell Speedway. INVERELL Speedway Reserve Trustees were delighted when they received news from Northern Tablelands MP Adam Marshall that they’d secured a $32,775 Public Reserve Management Fund (PRMF) grant to upgrade the reserve’s water pump and fire-fighting equipment. While visiting the Inverell Speedway last week, Mr Marshall praised the hard-working Trustees for the work they were doing to ensure the future of the speedway. “I was particularly pleased to deliver this news as all the trustees are relatively new to the role and this was a last-minute application to make some major improvements to their fire-fighting capabilities,” Mr Marshall said. 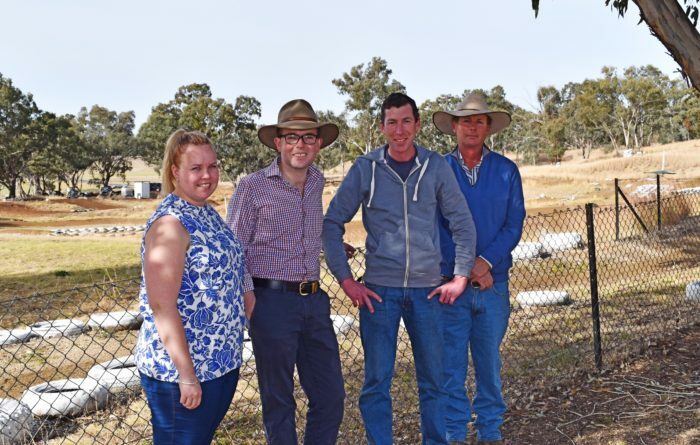 “The Speedway Reserve is home to two user groups, the Inverell Motorcycle Club and the Inverell Mower Sports Club, and members from both clubs put their hands up when the State Government was looking for new trustees. “The grant will allow them to purchase a solar power bore pump plus fire-fighting equipment and a water tank which will be mounted on a trailer. “The reserve covers quite a large area and includes two speed tracks so it’s important the firefighting equipment is easily transportable and the water immediately accessible. “I commend these new trustees for volunteering for this role. Countless facilities like showgrounds, local halls, parks and sportsground are run by Trust Boards and are made up of people prepared to volunteer their time to manage public land and assets for the benefit of the entire community. Inverell Speedway Trust Secretary Ashleigh Taylor said the trustees were delighted with the grant and thanked Mr Marshall for his support.